Home Who are we? Graduate Students Victoria “Tori” Makal, M.S. Victoria “Tori” Fielding is a native Texan, and earned her Bachelors of Science in Wildlife and Fisheries Sciences at Texas A&M University at College Station, with a specialization in Vertebrate Zoology. Upon graduating in 2014, she moved to Gainesville to complete a Master of Science in Biochemistry and Molecular Biology under the supervision of Dr. Mavis Agbandje-McKenna. During that time, she focused on the biophysical characterization of reptilian dependoparvoviruses as potential alternative therapeutic gene delivery vectors. 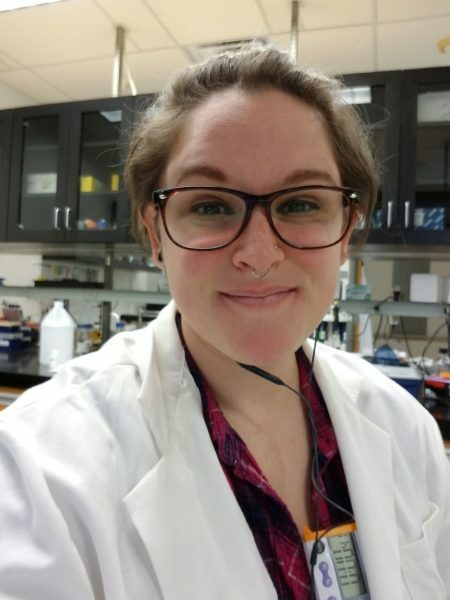 She completed her Masters in Fall 2016, and began working as a technician in the Boye lab before re-enrolling as a graduate student at UF in order to complete her doctorate. Her current work focuses on the cryo-EM based structural and biophysical characterization of AAV capsid mutants and the overarching goal of developing novel variants with improved transduction of retinal photoreceptors following intravitreal injection. Fielding VE. CHARACTERIZATION AND COMPARISON OF SQUAMATE DEPENDOPARVOVIRUS TYPE I TO MAMMALIAN ADENO-ASSOCIATED VIRUSES. University of Florida College of Medicine. 2016. Thesis. Serves as a volunteer foster home and adoption coordinator for Gold Coast Greyhound Adoptions, in order to place retired racing greyhounds into permanent adoptive homes in the Gainesville area.